With a pair of Virginia offensive linemen announcing last week that they are transferring out of the program, Cavaliers coach Bronco Mendenhall got some good news on the transfer front on Sunday. 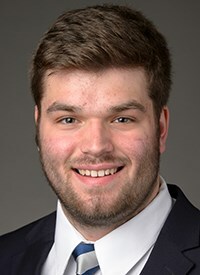 Penn State offensive lineman Alex Gellerstedt, who will graduate with a degree in finance in May and will have two years of eligibility remaining, announced Sunday on his Twitter account, that he intends to transfer to Virginia. He will be eligible to play immediately. Gellerstedt, 6-foot-6, 311 pounds, originally from Dublin, Ohio, originally chose Penn State over Virginia, Pittsburgh, Northwestern, Kentucky, Indiana, Vanderbilt, Duke, and others. While he played in seven games as a redshirt freshman, and only one as a redshirt freshman this past season, he was expected to compete for the starting right tackle slot for the Nittany Lions, a spot vacated by Ryan Bates, who is leaving Penn State early to enter the NFL Draft. Virginia is losing three starting offensive linemen in senior right guard Jake Fieler, graduate senior right tackle Marcus Applefield, and junior left guard R.J. Proctor, who announced he is transferring. In addition, backup right guard Ben Knutson, a sophomore, also said he plans to transfer. “I would like to thank Coach (James) Franklin for giving me the opportunity to be a part of this great program. I want to thank Coach (Matt) Limegrover for helping me to develop as a player. In my time at Penn State, I have made friends for life and had a chance to be a part of a truly special community.